– Answer the poll: What job on a genre show would you like? – Tuner Minute: Blinded by Rage. Join in the forum discussion here. You can listen to the episode now by using the ‘Play’ button below or follow the break for detailed Show Notes. Episode #179 hosted by Wendy Hembrock, Brent Barrett and Kevin Bachelder. Recorded on 2/4/12. Edited by Brent Barrett. Promo for The Weird Show podcast. I just wanted to provide a little feedback on this week’s Tuner Minute. Let’s start with the confession up-front: I think that I would probably have to be classified as almost a “rage-a-holic” when it comes to tv shows (and movies). While I generally consider myself to be a pretty rational personal, I have some very unstable emotional ‘fault-lines’ that once triggered, can really sour my opinion of a particular show — even to the point of coming to hate it. One thing that gets me a lot in shows are racial stereotypes. This isn’t nearly as much of a problem as it used to be, but every now and then, I still find myself shocked when a show introduces a character who is little more than a borderline-offensive cliche. When that happens, it pretty much invalidates the show for me, and the chances of me persisting with it are virtually nil. Not only that, but I’ll probably go out of my way to warn other people off the show. Another source of trouble that crops up way more frequently concerns female characters. Just as in real-life, I take more readily to women than men. It’s not that I hate all men, or like all women, but that I gravitate towards femininity, and am repelled by masculinity. Television tends to cater to the predominant attitudes and values of the culture that produces it, and so the male characters (and the actors cast to play them) fall on the more masculine end of the spectrum. As such, I rarely find myself reacting positively to any of the male characters (especially the ones we’re “meant” to like), and HATE when they are paired up with any of the many female characters I do like. Game of Thrones, Buffy the Vampire Slayer, and Fringe are all shows I love immensely, but I’ve had problems getting through all three of them. Every time Game of Thrones cut to the Daenerys/Drogo scenes, I would seriously contemplate ditching the show then and there. 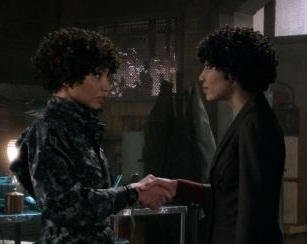 Fringe almost lost me in the first season due to the guy Olivia was paired with. Buffy — perhaps my all-time favorite show, with my all-time favorite actress (Sarah Michelle Gellar) — I cannot even re-watch because seeing the lead character paired up with the likes of Angel and Riley (was that his name? I can scarcely remember) is simply too much for me to bear. On a related note, I cannot endure a show where all the female characters are passive and weak, and rely upon the male characters to save them from peril. Like racial stereotyping, this isn’t nearly as prevalent as it once was, but it still crops up every now and then. If not for Arya Stark, and the promise of her coming into her own as a warrior who doesn’t depend on the sanction or protection of men, then I don’t know I could have kept going with Game of Thrones. And Once Upon a Time, with its “I didn’t need a man, but now I totally do” depiction of Snow White sent my rage-o-meter into overdrive, and I couldn’t watch the show anymore after that. I’m also guilty of loving shows up until a finale (either season or series) just “goes off the rails,” as I would put it. So count me among the detractors of the Lost and Battlestar Galactica finales, because there is absolutely no way I could go back and watch those series with the knowledge that the final answer supplied for every question raised over the course of each show was “god did it.” That answer does not satisfy me in real life, and it definitely doesn’t cut it in entertainment, either. If I were to try to find identify some kind of pattern in the things that tend to inspire rage-quitting behavior on my part when it comes to TV, I guess it would come down to the shows contradicting my values in some major way, and/or feeling like they’re insulting my intelligence (such as it is :p ).